Kill Bill Meets Star Wars: A Petersburg Collector Shows Off Quirky Movie Memorabilia in a New Exhibit | Arts and Culture | Style Weekly - Richmond, VA local news, arts, and events. It’s a golden opportunity, in other words, to ogle a rebel fleet trooper’s helmet and blaster before “Star Wars: the Last Jedi” lands in our galaxy come December. It was “Star Wars” that first got Woodmancy into collecting movie memorabilia, but his interest continued as films were shot in Petersburg, such as the current “Juanita,” with Blair Underwood and Alfre Woodard. Visitors to the Petersburg Area Arts League will see several of the movie’s sets nearby. “I’ve been collecting for more than 20 years at least,” Woodmancy says. “But not as much as I used to do, because I ran out of room to display it all.” The exhibit contains more than a hundred items, with almost the same number at home due to lack of space. Posters and print clippings provide context for the objects. With the top of the staff Ra from “Raiders of the Lost Ark” acting as a talisman, Wooodmancy’s goal is larger than putting on his full Darth Vader costume — though he’s been known to do that for the Christmas parade — or showing off his collection. 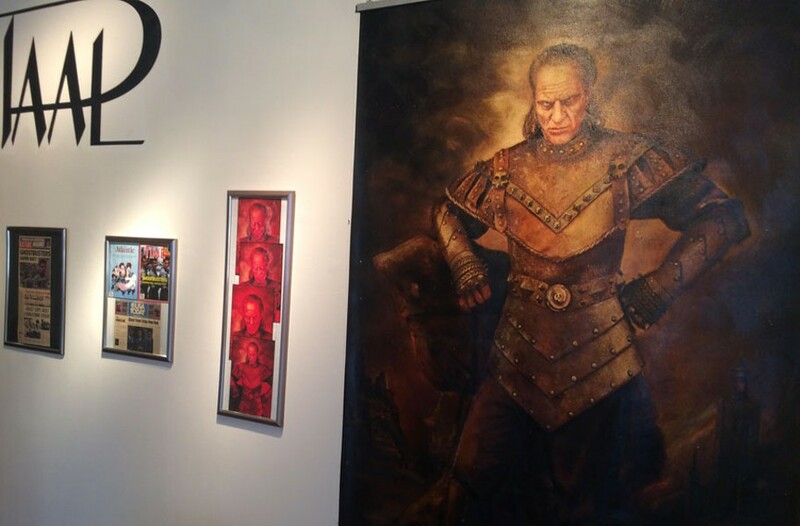 “Lights, Camera, Action: 20 Years of Collecting Movie Memorabilia” through May 7 at Petersburg Area Art League, 7 E. Old St. in Petersburg. paalart.org.